Choosing to take your next ski holiday in Telluride ski resort, will surely be a great experience but it could potentially also be a costly trip. Built on the rubbles of an old mining town, Telluride ski resort still carries the legacy of being filled with gold - although now in the shape of tourist dollar bills. In various magazines, Telluride has been accredited as being one of the most beautiful ski resorts on the continent. The only real issue encountered when Spending your ski holidays in Telluride ski resort is the likelihood that you might certainly want to return again next year. Telluride Ski resort located on the verge of famous risky mountains in a mountain village, Colorado (North America) right next to the town of Telluride around 330 miles from Denver, Colorado. The Telluride ski resort has been ranked #1 in Nast Traveler’s--Reader’s choice survey for three Consecutive years from 2013 to 2015 and have been famous for its serene beauty. The resort has over 2000 acres (810+ hectares) or (8.1 km²) of the skiable area under private ownership of Chuck Horning and Co. For skiing, snowboarding, and other snow adventures, the area extends from 8,725 feet (2,659 meters) to 13,150 feet (4010 meters), which means it’s a vertical drop of 4425 feet (1349 meters). It has a total a total of 127 runs for all abilities, in which 59% (75runs) are of beginner and intermediate levels. The Resort’s in-bound terrains that stretch up to over 2000 acres of skiing area has 127 runs for all abilities and levels; ranging from beginner, intermediate and advanced. It also has the longest run called ‘Galloping Goose’ that stretches up to 7.4km (4.6miles) of ascending slopes. 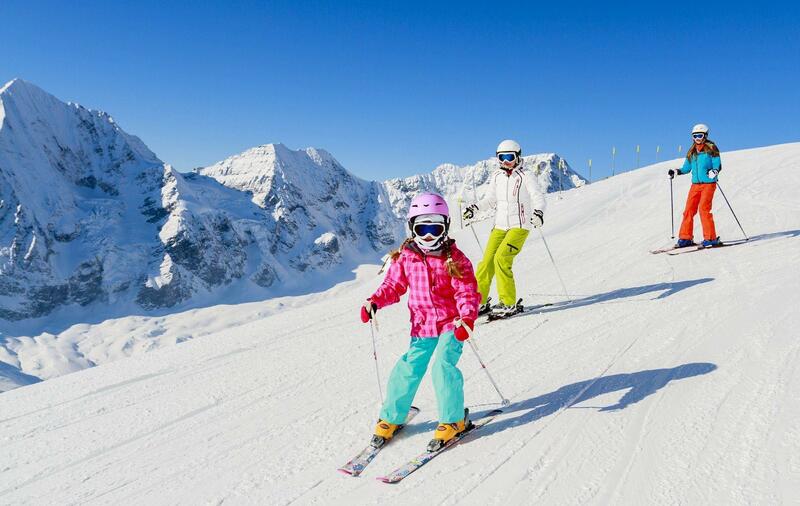 No matter, whether you just started to take an interest in skiing or snow-bordering or consider yourself an experienced or seasoned skier, you will find plenty of slopes from beginner to expert level to make the most out of your visit at this beautiful skiing hotspot. In the scale of percentage out of 127 skiing runs, 23% are sophisticatedly crafted and designed for beginners, 36% for intermediates and 41% for advanced and pro level athletes. Moreover, the intermediate and advanced level runs, pass through dense snows, deep-snow areas, and zones, snow-cloaked meadows and woodlands, which will surely amplify your overall skiing experience. Many people who know about Telluride ski resort know that this place isn’t just a ski resort, it is, in fact, a complete fun-filled holiday hotspot with unlimited escapades and activities. Lift-System like No Other Place! Telluride ski resort is largely known to provide splendid skiing runs all across the resort. It also has some of the finest and sophisticated lift systems installed for taking tourists to the top again for yet another run. The resort has a total of 18 lifts; 2 gondolas, 7 high-speed quads, 1 quad, 2 triple chairlifts, 2 double chairlifts, 2 surface lifts, 2 magic carpets) and has the capacity to take approximately 22,386 skiers per hour—to the top. The Telluride resort and its competitive staff have high-tech equipment and machinery for maintaining tracks and Runs. Snowmaking guns and grooming machines and superior track-maintenance techniques are put to task to restore runs into their original capacity after each couple of days. The resort also has ski- instructors who train beginners or amateurs to learn the art of game before taking on hard skiing routes. What Telluride ski resort is best known for! Unarguably, this resort is the finest example of ideal skiing, serene environment, exquisite scenic views and much more where you can enjoy your holiday at your own pace with a comfortable and laid-back atmosphere. So, people anticipating to have a perfect holiday amid lush forests, arid plains, lakes, alpine forests and epic natural beauty in and around Telluride Mountains can expect to have a lot of fun. So, it wouldn’t be wrong to say that this place offers the most epic experience in entire North America. This resort is certainly a worthy visit place! Telluride Ski Resort-- Runs For All Levels And Abilities! No matter whether you are a pro skier or just stepped into learning the art of the game, the resort has run for all levels and abilities. A vertical drop of 4425 feet (1349 meters) adds an immense to your skiing runs. However, before taking on difficult runs, you have to make sure that you have developed enough skills to ride properly. Telluride Ski Resort — Why Is It Distinctively Ameliorated! Like I mentioned earlier, Telluride ski-resort is North America’s best kept secret skiing hotspot, it attracts tourists, celebrities, artists, outdoor enthusiasts, sightseers, bag packers, and vacationers from every corner of the world. While other skiing resorts in European and North American Alps stay occupied throughout the winter season, in fact year-round, this resort offers a unique serenity—free of frequent hustle bustle. While Kardashians and other celebrities are happily followed by news magazines, paparazzi, and other news agencies around Vail and other famous North American skiing hotspots, Telluride is home of many A+-list superstars who prefer going Telluride to not to get seen or get caught with their wannabe girlfriends. With the free San Sophia Gondola that connects downtown Telluride to the new Mountain Village and runs until midnight, you can effortlessly move around different bars according to your penchant. Just like the food, the Telluride nightlife is a fascinating mixture of historical and contemporary. For the most part, the Telluride nightlife is vibrant in town, while the enhanced après-ski activities are at the Mountain Village, which receives terrific sunshine during the summers. At night the Colorado Main Street and West Colorado Avenue are filled with night-dwellers who want to have some fun after a fun day of skiing. The bars and theaters are the main attraction of Telluride along with fantastic food. Saloon hopping, live music along with your favorite wine or beer is a perfect way to spend the evening with your friends and loved ones. Typically, a restaurant in Telluride would have a bar alongside, but if you want to hit the dance floor as well, these bars are going to lift up your mood. Liberty Bar and Lounged has surfaced in Telluride just recently in 2017 and offers an experience unlike any other in the area. You can appreciate a refreshing cocktail while sitting on a comfy couch and listening to DJ play live music. The beats are likely to touch your soul, and your passion for dancing is destined to be rejuvenated. That’s not it, the designer lights and exposed bricks give the place a lively ambiance that will leave you with an experience of a lifetime. You can dance late into the night along with lip-smacking cocktails. The New Sheridan Bar is attached to a New Sheridan Hotel where you can have a Jack Daniels for or a round of pool for $5. The fascinating aspect of this bar is that it has remained exactly as it opened in 1895 with minimal modifications. The divider panels, lead glass, mahogany wall paneling and ornate light fixtures offer the place an alluring appeal, which is difficult to resist for the first time visitors. The bar also has a small menu, offering delicious Parmesan Truffle Fries and Deli Style Rueben and the menu is only open from 5:30 – 10 pm. If you are in a mood to have a game of foosball, pool or to hear live music, the New Sheridan Bar is a place for you to be. Smugglers Brew Pub is one of the finest places to eat freshly sourced Colorado beef, lamb, pork and chicken in Telluride. Along with great food, the brewery offers an intricate mixture of traditional lagers and seasonal beers, which are only available in the vicinity. The head brewer TJ Daly has received multiple awards for brewing great seasonal beers like Vanilla Porter, which is warm, has sweet notes and full of chocolaty aftertaste; not for faint-hearted people. For cocktail lovers, There Bar is a place where all the inventiveness happens. Along with creativity in their offerings; the place is aesthetically decorated. Perfect for your Après ski escapades, the bar has a wide-ranging menu including tapas, small bites, meals, desserts and a stimulating grapefruit martini that is a must-have. You would not want to leave, once you arrive at the destination. This secret holiday hotspot has always been an ideal place for anyone anticipating to have a lot of fun on the slopes, as well as in and around Telluride Mountains. This resort is a perfect recreational hotspot and impeccable getaway from the monotonous chores of life. Besides offering an unforgettable skiing experience, this awe-inspiring, and uncrowded sanctuary offers unlimited outdoor activities, fun-filled events, and upscale amenities. In short, you can expect to have a lot of fun and adventure on the peaks, resort area and scenic pathways leading to nearby villages. From the serene environment and scenic natural beauty of the mountains to sports adventures and hiking, it has something for everybody to keep one occupied! The Telluride skiing resort has been gaining popularity over the years, which means more and more people from all across the globe are now planning their holidays to the resort ultimately increasing the visitor influx. There are tons of options and activities to choose from after having a busy day on the slopes since it has so many happening-places in and around the resort both in summers and winters. Since dense snow in winter restricts you to have a lot of fun-filled activities like fishing, boating, hiking, motorsports, etc. and all you can do is either ski or snowboard or enjoy in indoors facilities, clubs, spas. However, in summers, you can make the most out of your trip and enjoy the Telluride Mountains at its best. To make the most out of your first trip to Telluride ski resort, we have compiled a list of non-skiing activities that you can enjoy with full swing. There are many river and streams in the whereabouts of telluride region that is absolutely ideal for fishing all year-round. However, the ideal season last from February to April, where there are excellent fishing opportunities in San Miguel River. No matter, whether you are returning from slopes or calling a day off from skiing, these beautiful areas offers a lot to travelers. The famous the San Juan Mountains are well known for ice climbing and offer several winter climbing opportunities. These mountains call daredevils from every corner of the world in the winter season. However, you may still hire a local guide who would guide you through dangerous pathways. With new regulations imposed, the daredevils must sign an agreement of rules, which must be followed no matter what. Horseback riding is surely a memorable activity. This will surely ignite your emotions and help you to remember your visit for long. Moreover, pleasing horse riding through alpine meadows and aspen forest will amply your overall experience. For panoramic views of looming peaks, sights of the charming main street area and witnessing marvels of Telluride Mountains, you must take a free ride in Telluride Gondola. It is a blessedly short ride between two mountain villages, and the recent development of lift infrastructure of Gondola has made the ride even more fun which lasts 16 minutes, and you are there! Hiking is the most beloved activity of the summer season. There are plenty of terrain and scenic views in the whereabouts of telluride region that can be explored through hiking. All that you need to do is get yourself prepared before commencing your hiking excursion. As soon as summer heats up, the pools both private and public get occupied in entire Telluride and Mountain Village. However, these pools are not free of cost; you have to pay for it to have fun at your own pace. Plus, there is also seasonal membership through which you can save a tiny portion of your budget.